It's the busiest time of the year - not only do I have to do various Christmas preparations and catch up with old friends whilst I'm back in Plymouth, but I also have five exams to revise for. The exam gods have not been kind, and all of them have been placed between the 17th and 25th of January. This also (for the sixth year running) puts a bit of a damper on my birthday celebrations. There is a small sliver of hope on the horizon, though, because these are my last set of exams. From February I'll have a project to write, which is worth half of my final year but at least it's not examined, and to be honest I really don't mind spending nine weeks in the lab and writing about it if it means I won't be spending every day and night between May and mid June forcing myself to learn things. I haven't been in the lab since March, so I'll be excited to return, if not a little apprehensive. I've started worrying about the type of thing you worry about on your first day at school: where do I go? What time should I get there? How will I know I'm doing it right? Being away from chemicals for so long (and a lovely health and safety talk about lab explosions and people's faces melting etc) has left me a little nervous about using the more dangerous ones again (I'll be using butyl lithium, which will set your clothes on fire if it gets in contact with them), but I know once I get back into routine everything will fall into place and I'll be finishing the year with my clothes, face and the lab in one piece. Anyway, let's not dwell on the distant future: it's nine days to Christmas! I have so many ideas flying around my head that I've made a list so that I don't forget anything. Much as I need to revise, there will always be time for cake (or biscuits, or eggnog...) so don't worry, you'll still be getting regular posts from me. Let's start with the biscuits I made today. These are cinnamon biscuits, sandwiched together with chocolate ganache. Sounds pretty good, right? That's because they are! 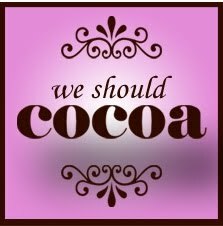 I have to admit that chocolate is not the first thing would I think of to combine with cinnamon, which is why I was a little stumped when Choclette set cinnamon as this month's We Should Cocoa challenge (We Should Cocoa is a monthly challenge that was started by Choclette of Chocolate Log Blog and Chele of Chocolate Teapot). I figured that if Choclette had set the challenge then they must go well together, though - she is an expert in all things chocolate, after all. I didn't want to make a cake (I have a different one planned for Wednesday), and I realised that I'd not made biscuits for years - certainly not the cookie cutter type - so it was time I gave them a try. These biscuits are actually perfect for someone who has a lot of work to do because you have to leave dough in the fridge twice, then cook the biscuits, then wait for the ganache to set, so there is little hands-on time and plenty of revision time. These will also make a good revision snack! The recipe for these is adapted from one for gingerbread from BBC Food. I exchanged the treacle for evaporated milk (which I was disappointed to find is not as tasty as condensed milk when licked off the spoon), used caster sugar instead of light muscovado and left out the ginger. I also halved the recipe and added the chocolate ganache. I think this would work with a dark chocolate ganache as well, and of course you could use different shaped cookie cutters. For tips on how to make these cookies low fat and low sugar whilst retaining the flavour, take a look at Healthy(ish) Baking. Sift the flour and cinnamon into a mixing bowl, then add the caster sugar and butter. Rub the butter into the dry ingredients using your finger tips until the mixture resembles breadcrumbs (I call this the breadcrumbs method). Add the egg yolk and evaporated milk, then stir in and squish the dough together into a ball (if the mixture is still a little dry, add another tbsp evaporated milk. Cover the dough with clingfilm and refrigerate for 20 minutes. Flour a clean surface, then place the dough (sans clingfilm) on top. Flour a rolling pin and roll the dough to about a half centimetre (1/4in) thickness. 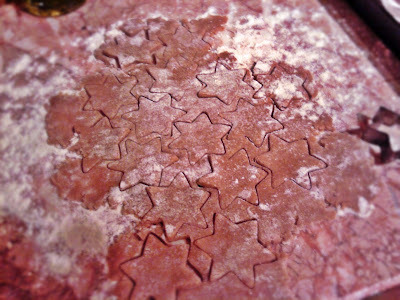 Use cookie cutters to cut shapes out of the dough and use a spatula to place them on a baking tray (or two) that has been covered in parchment paper. Place the uncooked biscuit-covered baking trays in the fridge for half an hour. This ensures that the biscuits do not lose their shape. Preheat the oven to 180C/160C fan. Put the biscuits in the oven and bake for 12-15 minutes, or until they have begun to brown. They will still be soft at this point, and will harden as they cool. Place the biscuits on a cooling rack. To make the ganache, break the chocolate into a pan and cover them with the water. Put the pan over a low heat, stirring occasionally, until the chocolate has melted and combined with the water. Remove from the heat and leave until it has thickened. Pipe the ganache onto one cookie and sandwich another on top. Repeat until you run out of cookies! Thanks Choclette! I really liked the combination so I'll definitely be using it again.